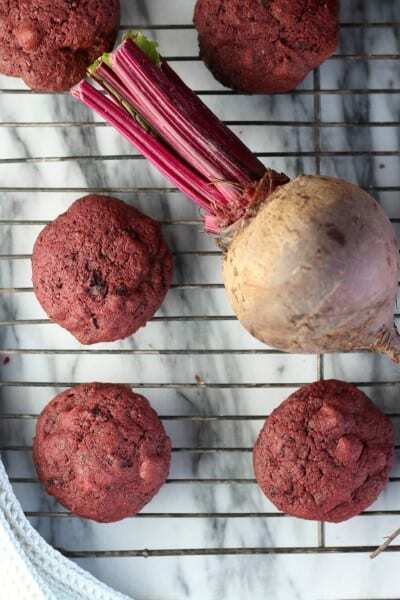 Red Velvet Chocolate Chip Cookies made with beets have no artificial colors– the beets do all the work to achieve this festive hue! 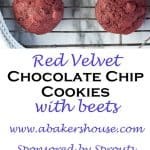 Red Velvet Chocolate Chip Cookies with Beets: Yes or no? Give it a try! Beets are the not-so-secret ingredient in the deep color of these chocolate chip cookies, but the real mystery is how the taste is not different from a traditional cookie. 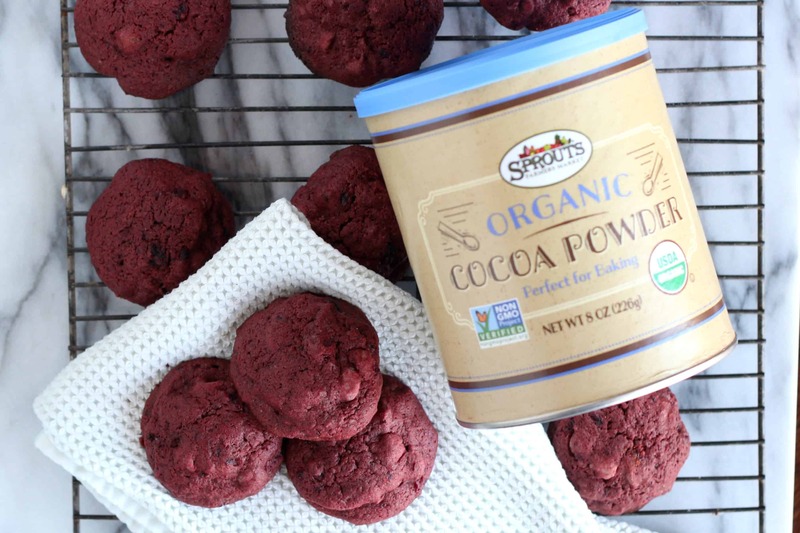 Combined with Sprouts organic cocoa powder, the earthy flavor of the beets melds seamlessly in this sweet treat. Give this healthier twist a chance and incorporate beets into your desserts! I was hesitant with these cookies. The color. The ingredient list. 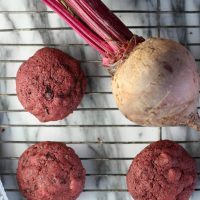 The idea of BEETS in my cookies! But I am the first to say that I was happily surprised with these double chocolate chip cookies. Red velvet cookies, in fact. Sprouts organic cocoa powder and semi-sweet chocolate chips offset the yes-I-came-straight-from-the-earth taste of the beets. The color is as close to red as I have gotten without using artificial flavors which makes these a fun Valentine’s treat. One piece of advice: wear gloves when you are peeling and roasting the beets. Beets stain quite easily. Mix in a metal or glass bowl that will wash easily; plastic bowls are not a good choice. Red Velvet Chocolate Chip Cookies made with beets have no artificial colors-- the beets do all the work to achieve this festive hue! Roast the beets: Peel and quarter the beets. Toss with 1 tablespoon olive oil and roast in a 400 degree F oven for 45-60 minutes. Puree the beets with 2 ounces of freshly squeezed orange juice. Process until smooth. You should have approximately ½ cup beet puree. Let the puree cool to room temperature before proceeding. In a medium bowl combine the dry ingredients: flour, cocoa, baking powder and salt. Whisk gently to combine. In a stand mixer beat the butter with the granulated sugar and the brown sugar. Add the eggs one at a time. Add ½ cup roasted beet puree and blend until smooth. Slowly incorporate the dry ingredients and mix until just barely combined. Add the chocolate chips to the dough and stir until well-dispersed. Drop dough by the tablespoon onto parchment lined baking sheets. Click over to Sprout Brand website for the full recipe. Thank you to Sprouts for partnering with me on this recipe. 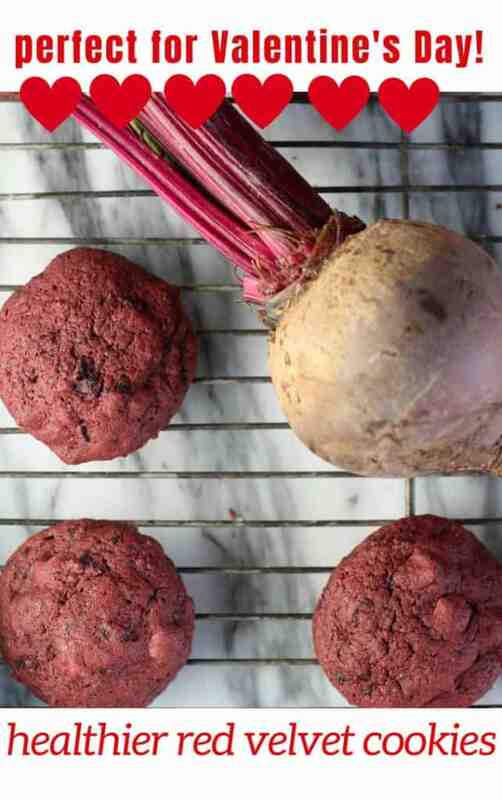 This is a sponsored post for which I was offered the challenge of baking with beets and I happily accepted. Are you on Pinterest? I am! Come pin with me and save this healthier red velvet cookie for Valentine’s Day! The truth is I love all cookies, so I am sure I would be all over these. My tip about cocoa is to always make sure the lid is secure. I recently had a cocoa accident and it flew all over my pantry. What a mess! In any case this has not deterred me from using cocoa! These sound great Holly!